As your outsourcing partner we provide cost-effective access to various services usually provided by the Export Department of major corporations, without the expenses or burdens associated with the introduction of your product line overseas or the overhead generated with a fully staffed Export Department. Selling overseas can be as simple as receiving an export Purchase Order by scanned document or fax! We remove the "headaches" connected with international trade. We pay the US supplier in a fashion similar to a typical domestic transaction. There is no foreign currency or overseas receivable collection risk. We provide the necessary information to develop multilingual presentations, product specifications - necessities if your product line is to have commercial success in overseas markets. We verify the acceptability of US specifications and standards used during the manufacturing process. We relieve you from all the issues connected with the complexities and time-consuming international paperwork (documentation). 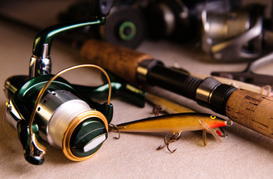 We attend fishing tackle exhibitions and trade shows (domestic and international). We develop an in-depth understanding of your product line - without which your business cannot grow. We provide consulting work - to help organize your export business. We offer you the ability to understand foreign markets, culture and customs. To better understand what an export management company does, please access "What is an EMC?" in the menu bar. To have one of our Export Managers contact you, please click on our Contact Us form.